This electron microscope image depicts a sample of rebar graphene after testing, which involved materials scientists at Rice University slowly pulling the rebar graphene apart. It shows how cracks propagate in a zigzag way, rather than straight, as would be seen in plain graphene. Image: Emily Hacopian/Rice University. Researchers at Rice University have found that fracture-resistant ‘rebar graphene’ is more than twice as tough as pristine graphene. Graphene is a one-atom-thick sheet of carbon. On the two-dimensional (2D) scale, the material is stronger than steel, but because graphene is so thin it is still subject to ripping and tearing. Rebar graphene is the nanoscale analog of rebar (reinforcement bars) in concrete, in which embedded steel bars enhance the material's strength and durability. Rebar graphene, developed by the Rice lab of chemist James Tour in 2014, uses carbon nanotubes for reinforcement. In a new study, reported in a paper in ACS Nano, Rice materials scientist Jun Lou, graduate student and lead author Emily Hacopian and collaborators, including Tour, stress-tested rebar graphene and found that nanotube rebar diverted and bridged cracks that would otherwise propagate in unreinforced graphene. The experiments showed that nanotubes help graphene stay stretchy and also reduce the effects of cracks. That could be useful not only for flexible electronics but also for electrically active wearables or other devices where stress tolerance, flexibility, transparency and mechanical stability are desired. Both the lab's mechanical tests and molecular dynamics simulations by collaborators at Brown University confirmed the material's toughness. Graphene's excellent conductivity makes it a strong candidate for use in electrical devices, but its brittle nature is a downside, Lou said. His lab reported two years ago that graphene is only as strong as its weakest link. Those tests showed the strength of pristine graphene to be ‘substantially lower’ than its reported intrinsic strength. In a later study, the lab found that molybdenum diselenide, another 2D material of interest to researchers, is also brittle. Tour approached Lou and his group to carry out similar tests on rebar graphene, which is made by spin-coating single-walled nanotubes onto a copper substrate and growing graphene atop them via chemical vapor deposition. To stress-test rebar graphene, Hacopian, Yang and their colleagues needed to pull it to pieces while measuring the force that was applied. Through trial and error, they developed a way to cut microscopic pieces of the material and mount it on a testbed for use with scanning electron and transmission electron microscopes. 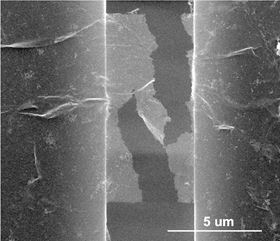 In earlier tests, Lou's lab showed graphene has a native fracture toughness of 4 megapascals (MPa). In contrast, rebar graphene has an average toughness of 10.7MPa, Lou said. Simulations by study co-author Huajian Gao and his team at Brown confirmed the results of the physical experiments. Gao's team found the same effects in simulations with orderly rows of rebar in graphene as those measured in the physical samples with rebar pointing every which way. He added that the rebar graphene results are a first step toward the characterization of many new materials: "We hope this opens a direction people can pursue to engineer 2D material features for applications." Conductive graphene foam reinforced by carbon nanotubes can support more than 3000 times its own weight and easily bounce back to its original height.